On the first day of the 2009 Regular Session, lawmakers were presented with a proposed budget for Fiscal Year 2010, which included $4.3 billion in general, and lottery revenue. Since then, however, in light of the current economy and forecast budget shortfalls in the near future, the Legislature has been requested to trim the budget by over 4 percent from the original proposal. According to the State Department of Revenue, projected revenues for next year will likely fall short of what had been forecast when session began. The less than expected projections in general and lottery revenue will apparently leave the original budget bill short by around $200 million. This week, the Legislature adopted Senate Concurrent Resolution 68, which allows the Legislature to extend the session until June 6th solely for consideration of the budget, supplemental appropriations or to take up any veto messages. This will also allow members to address potential legislation relating to implementation of or expenditures associated to the American Recovery and Reinvestment Act of 2009, otherwise known as the federal economic stimulus program. Senate Finance Chairman Walt Helmick believes the additional time will be advantageous. "I'm happy the budget meetings have been delayed because we don't know where West Virginia's revenue stream is right now. The budget is $200 million to $250 million below the governor's original projection. This will give the Legislature more time to look over the budget projections. It allows for more fiscal responsibility." Meanwhile, House Finance Chair Harry Keith White thinks it is the right decision in light of the economy. "We in the House believe it's a prudent decision to wait until after we see the April tax revenues to finish work on the proposed Budget Bill. We have been asked to cut over 4 percent from the original proposed budget and members and staff of the Finance Committee will use the extra time to collect data and accurate numbers that reflect the current economic situation." It has not yet been announced as to when the Legislature will reconvene following the last day, April 11th, to begin work on the budget. Senate Bill 261 will require party executive committees to submit their list of election official nominees no later than the 70th day before the election. By moving up the time at which a list of nominees must be filed, county clerks have additional time to find alternates if those selected are unable to serve. Senate Bill 263 will allow the warden of a correctional facility or the administrator of a work release center to monitor inmate mail and phone calls without being specifically designated to do so by the Commissioner of Corrections. The bill allows this information to be released upon order of a court or an administrative tribunal in civil and administrative cases as well as criminal cases. The bill will expand the retention time of information from one to three years. If mail is sent from an attorney, the mail will be checked for contraband in the inmate's presence. Senate Bill 284 will allow viatical settlement brokers, whose business under contract buys life insurance policies from terminally ill patients for a percentage of the face value, to demonstrate financial responsibility by having an errors and omissions insurance policy of at least $20,000 for individual claims and not less than $100,000 in the aggregate per year. Current law allows a provider to show financial responsibility by having $250,000 in cash or cash equivalents or through a surety bond of $250,000. The bill also provides that criminal penalties apply to anyone convicted of a fraudulent viatical settlement act, not just the people who are licensed as a viatical settlement broker or provider. Senate Bill 307 will require the Bureau for Public Health to convene a diverse maternal risk advisory council to develop a uniform maternal risk screening tool to help pregnant women for potential at-risk pregnancies. The bill will require the Bureau to meet annually to revise the tool as needed. The council and Bureau are required to develop a statistical matrix to measure incidents of high-risk pregnancies. Senate Bill 341 will transfer the Juvenile Justice Database Administration from the Department of Military Affairs and Public Safety to the WV Supreme Court of Appeals. The Division of Criminal Justice Services will have access to juvenile records for the purpose of collecting and analyzing statistical data, which must be maintained confidentially. Senate Bill 384 will authorize the Department of Transportation to take control of an emergency scene on the highway if there is a possibility of the road closing for more than two hours. All actions taken on the scene must be consistent with the provisions of the National Incident Management System. Senate Bill 431 will reassign the responsibility to notify in-state medical providers of small group health benefit plans to the West Virginia Health Care Authority instead of the Public Employees Insurance Agency. Senate Bill 453 will allow the Public Service Commission (PSC) the option to serve recommended decisions by electronic mail instead of by certified mail. The party must have the capability to receive the electronic transmission, furnish an email address and agree in writing to accept recommended orders electronically. The transmissions will contain a “return receipt” mechanism to assure the party received the recommended order. If the PSC does not receive the electronic confirmation from the party within three business days, it will serve the order via certified mail. Senate Bill 489 will allow the Board of Banking and Financial Institutions to receive compensation for travel expenses. The board meets at least once in each calendar quarter, though the commissioner can call additional board meetings with at least 24-hours notice. Members would be reimbursed for all reasonable actual expenses for attending meetings in accordance with the regulations of the State Purchasing Division. Senate Bill 526 will revise the requirements for postdoctoral training as a requirement for licensure as an osteopathic physician. It will provide for educational permits for post-doctoral clinical training, and defines the scope and duration of the permits. It also allows the board to set up emergency rules to establish requirements for the issuance and renewal of permits. Senate Bill 672 will create the Mental Health Stabilization Act of 2009. It increases reimbursement rates in mental health service codes. It also requires the Secretary of the Department of Health and Human Services to provide monthly reports to the Joint Committee on Government and Finance and the Legislative Oversight Commission on Health and Human Resources Accountability. Senate Bill 719 will allow a police officer to keep his or her service revolver upon retirement, with the consent and approval of their police chief. The bill will change “service revolver” to “service weapon”, to more accurately describe the current sidearms used by police. The standard issue handguns that are currently in use as police service weapons include 9 mm, .40 and .45 caliber semiautomatic handguns. Senate Bill 760 will authorize the W.V. Supreme Court of Appeals to establish up to five pre-trial release programs for existing probation offices and day-report centers to reduce jail population while ensuring public safety. The program is limited to defendants charged with misdemeanors and non-violent felonies. The Court is requested to file annual reports with the Legislature. Senate Bill 764 will provide a procedure for certification of election results in multiple county races after all affected counties have publically declared the results. The 48-hour period to request a recount in a multicounty race would not begin until all of the county results were declared and certified. House Bill 2407 allows the Commissioner of Corrections to place any interest or other sum of money (less than $10) which would have been credited to an inmate's account into the inmate benefit fund. The bill would also allow the fund to be used for restitution of any negative balance on an inmate's trustee account. House Bill 2474 makes certain rules on the solid waste management of sludge inapplicable to land-based aquaculture facilities. Land-based aquaculture is the business of cultivating saltwater or freshwater fish or shellfish under controlled conditions. House Bill 2569 creates a special revenue account in the State Treasury known as the Juvenile Services Offender Fund. This account would be used to facilitate reimbursement of expenses incurred by the Division of Juvenile Services in housing juvenile status offenders. House Bill 2703 makes technical changes to the Teachers' Retirement System Act. Some changes include clarifying definitions within the code, specifying the ending of membership and clarifying loan offsets at time of withdrawal. House Bill 2734 clarifies that upon withdrawal from either the Teachers' Retirement System or the Teachers' Defined Contribution Retirement System, members are eligible to receive a return of their member contributions. House Bill 2757 incorporates recent changes adopted by the National Association of Insurance Commissioners to the "Annual Financial Reporting Model Regulation." These changes would improve the Insurance Commissioner's surveillance of the financial condition of insurers. House Bill 2795 creates a free special hunting and fishing license for persons with a life-threatening condition who are under 21-years old. House Bill 2839 eliminates the definition of "intractable pain" in the Management of Pain Act and replaces it with the definition of the word “pain,” currently in use by the Board of Medicine and the Board of Osteopathy. Rather than using the meaning of “intractable pain,” a state of pain having a cause that cannot be removed, the Management of Pain Act will adhere to the definition of “pain,” meaning an unpleasant sensory and emotional experience associated with actual or potential tissue damage or described in terms of such damage. House Bill 2904 authorizes rules for the Higher Education Policy Commission (HEPC) and the West Virginia Council for Community and Technical College Education (CCTC). The rules would cover guidelines for Governing Boards in employing and evaluating Presidents; the Medical Student Loan Program; the West Virginia Higher Education Grant Program; the Research Trust Fund Program; Accountability System; Performance Indicators; and Finance. House Bill 2952 clarifies that a terroristic threat is a felony regardless of intent to actually commit the threatened act. Persons found guilty would be fined $5,000 to $25,000 and/or confined in a state correctional facility from one to three years. House Bill 3066 clarifies the supervision requirements for elevator apprentices under elevator safety. After January 1, 2010, a person may not engage or offer to engage in the business of erecting, constructing, installing, altering, servicing, repairing or maintaining elevators or related conveyances unless he or she has a license issued by the Commissioner of Labor. House Bill 3076 relates to the regulation and operation of cranes by providing a new definition for tower crane, establishing certification renewal requirements for crane operators, providing for automatic certification of certain crane operators and creating a penalty for operation of tower cranes without certification. House Bill 3082 requires trustees foreclosing on occupied residential property to report the foreclosure data to clerks of the county courts as a part of the information to be submitted with the trustee's report of sale. It also requires the clerks of the county commission to file quarterly reports regarding foreclosed properties with the Banking Commissioner. Under this bill, the fee for recording a trustee's report of sale would be $30, with $10 retained by the county clerk and $20 going to the Banking Commissioner to finance the program. House Bill 3189 will add three representatives to the Capitol Building Commission. These additional members will be non-voting - with one being appointed by the President of the Senate, one by the Speaker of the House of Delegates and one by the Supreme Court of Appeals. This addition will increase the number of Capitol Building Commission members from six to nine. 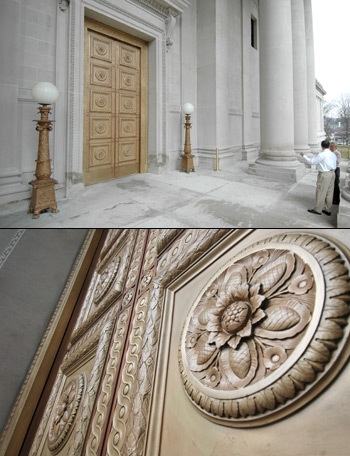 The massive 20-foot tall bronze and copper “pocket doors” are located at the south portico entrance and have been hidden from public view for years. Decades of dormancy had left the doors immovable on their rolling tracks until a restoration project earlier this year restored their mobility. Each of the doors features five panels, each with rosettes that celebrate West Virginia's native hardwood trees.